Posted August 30, 2007 in 2007/08, Odds & Ends, Topic, z Archive. I can offer no excuse for missing Jack’s birthday. I believe it is better to have missed the occasion then to ignore it altogether. To celebrate Jack I offer a sketch he did in 1942 for George Roussos. The paper turned a strong yellow so I used the magic of Photoshop to make it white again. I know it is the Boy Commandos, but who is that elderly lady? Posted August 24, 2007 in 2007/08, 6 Mainline, In Love, Periods, z Archive. The second issue of In Love kept to the concept of a long story broken up into three chapters. “Marilyn’s Men” is about Marilyn Morgan, her brother Jim, Lawyer Bob (he is actually called that), and Dave an airplane pilot. Jim is a constant source of scandals due to his numerous fights over girls, usually someone else’s. Lawyer Bob loves Marilyn, but unfortunately for him she does not return that affection. Marilyn heart still smolders for her high school flame Dave. Always on the look out for a big money making scheme, Jim entices Marilyn’s interest in a new project because this time it involves a deal with Dave for a new airport. This not only leads to a business partnership, but also to the renewal of love between Marilyn and Dave. All is not well because an attempt by Marilyn to prevent Jim from causing another scandal backfires with Jim leaving the partnership. But another scheme of Marilyn’s brings him back. Most of the art in this story was done by Bill Draut, and he does a great job. There are a lot of examples I could provide. There is a nice fight scene that starts the story, a great splash page, some interesting flying sequences, and more. Instead I have selected a page with no real action because it shows how well Bill could choreograph a page. I suspect some of the credit should go to the writer for so nicely directing the whole thing. But it was probably Draut who figured how to visually make it all work. We see Marilyn and Lawyer Bob enter the park. As they sit there is a flying pigeon in the foreground. Next a close-up of a pigeon and the couple’s legs. Marilyn cites the pigeon as a metaphor for freedom. Then the pigeon is startled and flies away with the shadow of a plane showing the source of that disturbance. It is Dave’s plane that the couple look up at as if flies away. Finally it is back to focusing on the couple as we learn the depths of Marilyn’s feeling for and about Dave and Bob. All very cinematic. That page and others do not have a Kirby feel to them so I once again doubt that Draut was working from Kirby layouts. There is one exception, a panel with Jim taking a drag from a cigarette while talking to Marilyn. Marilyn’s pose seems pure Draut, but Jim is so Kirby-like that I suspect Jack has stepped in to redraw the brother. Kirby did not draw any of the pages for the first two chapters of the story, but Jack did four of the seven pages of the last chapter. The first three pages are by Jack, followed by three pages by Bill and ending with another page by Kirby. I find it surprising that Jack’s contribution came so late in the story. Draut is a good artist but lets face it, Kirby is a better one, and also the boss. Normally I would expect that if Kirby only worked on part of a story it would be the splash pages and the start. 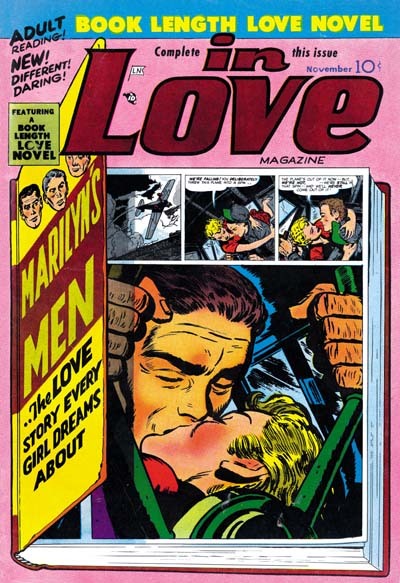 An advertisement in In Love #1 shows that at least some of the art for “Marilyn’s Men” was already completed at the time issue #1 went to the printers. So perhaps Jacks significant involvement in In Love #1 precluded initially working on issue #2 until the last chapter. If chapter 3 is thought of as a story in itself, Jack’s involvement with the starting pages and the end is just what would be expected. Jack did a beautiful job on the splash page, I believe he inked it as well. I will discuss the second page of the chapter below but I do not believe Jack was the primary inker. 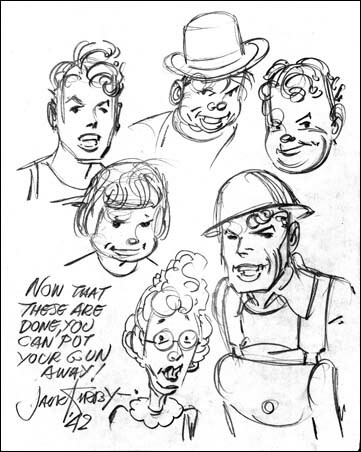 The third page (shown above) is a bit of a surprise, although clearly drawn by Jack it looks like the inker tried to make it looked like it was done by Draut. I do not think it was Draut who did this inking. Previously I wrote on Kirby imitating Draut and other artists in the content pages of Harvey romances. What was done here was just as unsuccessful. I suspect the attempt was made to provide a transition from the Kirby page to those done solely by Draut. It does provide a transition but at the cost of a truly ugly page of art. The same sort of Kirby transformed into Draut occurs on the last page as well, and it is just as unsuccessful. I supply the image for the second page of the third chapter above (page 17 of the entire story). The sequence actually starts with two panels on the splash page showing Marilyn as she passes through the park alone. The first five panels on page 17 is a sequence of two of Marilyn and the man, followed by one of the man meeting another women and then another two of Marilyn and the couple. Except for one panel where the man is up close, Jack generally puts Marilyn in the foreground with the background used for the man or couple, who are the actual focus of the panels. The next two panels show only the couple and the last has the couple again with Marilyn retreating in the background. The whole sequence is just a marvelous example of obtaining drama and tension just by the way the art is laid out. Kirby is justly famous for how he portrays action in a story, action-less drama on the other hand is not something that Jack did not do very often. Although rare, pages like this one or the one I wrote about from Foxhole #2 show that Kirby was a master of pure drama as well. The writing for this story is truly superior. All the pieces of the plot fit well together. Marilyn’s interference with her brother Jim in the last chapter makes no sense without Jim’s fight and scandal in the first chapter. The plot moves not just to provide an interesting tale, but as a means of presenting the cast of characters and providing their motivations. The character of Marilyn is a particular surprise. Generally a businesswomen in romance comics would be expected to abandon her career and find fulfillment in love. Not Marilyn, she gets it all, love and her career. When Marilyn’s interference in Jim’s love life backfires you would expect that she would have learn her lesson. Instead Marilyn no longer tries to break up Jim and his new girlfriend, but interferes once again in his life to bring him back to business partnership. One thing sets this story apart from many Simon and Kirby romances and that is emphasis on action. Since action is so often found in romance stories that Jack drew, I believe this indicates that Kirby played a significant part in the writing of this story. There are phrases here and there that also sound like Kirby’s writing. However most of the scripting does not sound like Jack’s, so I suppose another writer was involved as well. As I reread these issues I realize that it is not just the full length feature story that sets In Love apart. Most romance comic book stories can be summarized as boy meets girl, a problem occurs, finally love conquers all. (Do not trivialize romance comics because of this, superhero stories can be summarized into an even simpler formula). The closest that In Love stories come to that formula is “Bride of the Star” that I posted on earlier. Even there it was so much as love conquered all as that the man regained his own self confidence about pitching which allowed love to resume. The two short backup pieces in In Love #1 were both about already married woman. “Marilyn’s Men” is just as much about Marilyn’s relationship with her brother as it is about her love life. The backup in In Love #2 was more about the love of a mother for her child then it was the love between a man and a woman. It does seem that Simon and Kirby were trying to make In Love different from the rest of the romance titles just like the effort to make the rest of the Mainline titles standout from their competitors. Posted August 24, 2007 in 2007/08, 3 Timely, Assorted, Featured Work, Periods, Topic, z Archive. Daring Mystery had a rather sporadic schedule. Issue #7 came out seven months after the previous issue and it would take an addition nine months for #8 to be released. What a difference an issue made. 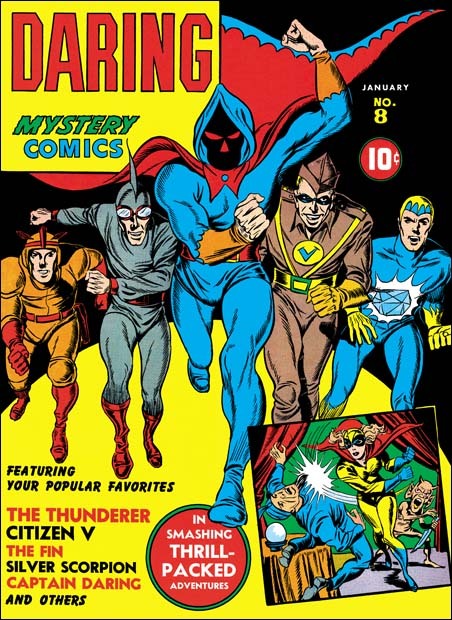 Daring Mystery #6 was produced shortly after Simon and Kirby started working for Timely. 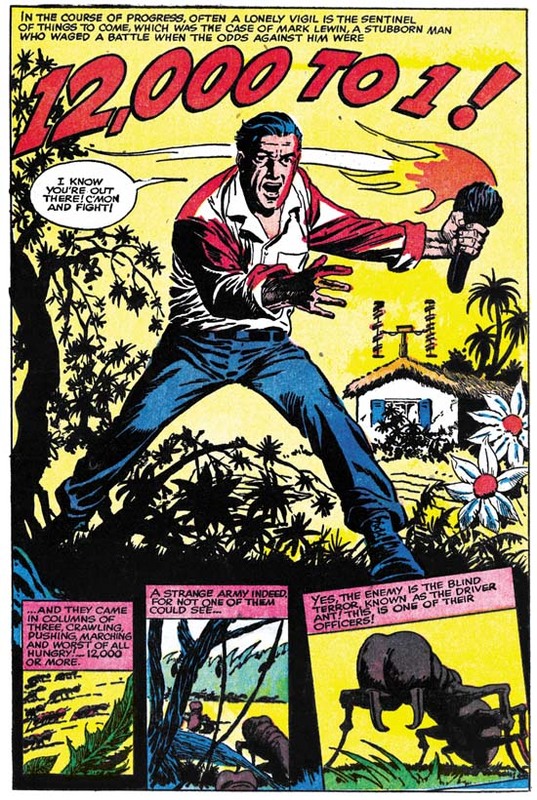 It included a Fiery Mask story, a hero Joe Simon created for Timely as a freelance artist when he had just started in the comic book business. DM #7 came out shortly after Captain America #1, Simon and Kirby’s first big hit. Issue #8 came out the same month as Cap #10, after which Simon and Kirby moved on to working for DC. So even though the cover for Daring Mystery #8 is only two issues away from that of DM #6, which I previously wrote about, what a difference that makes! While I am less then enthusiastic about the cover for DM #6, with DM #8 Jack seems to be in full form. One difficulty with anthologies is what do you put on the cover? 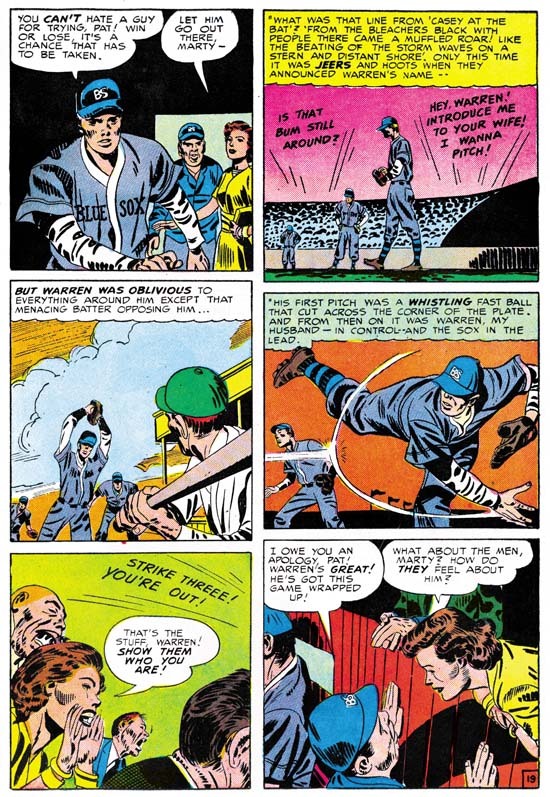 The most common technique was to just depict one of the comic’s heroes and list the others by text. While that works it may not be effective in attracting buyers more interested in one of the other characters. Some comics therefore include small images of some of the other features. But too many of these small images would limit the area for the main image. For Marvel Mystery and some other Timely comics the solution was a large image that included two or three key heroes (Human Torch, Sub-Mariner and Captain America). To be fully effective that technique required a good artist. someone like Alex Schomburg. But Daring Mystery did not have any of these key characters, its features were constantly changing. I do not know if Simon and Kirby were the first to present a solution like that for DM #8, but Jack sure makes it look easy. Five heroes charging in a ‘V’ formation makes effective use of the cover area. At this point Kirby excels in the use of exaggerated perspective so even the simple act of running looks exciting. 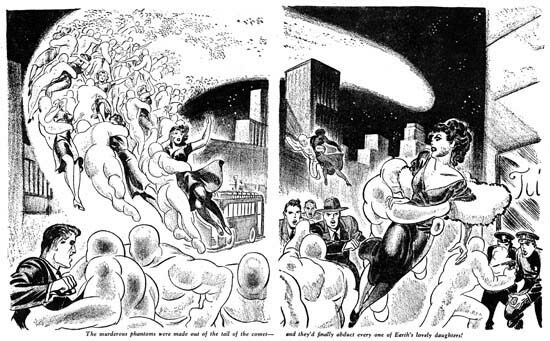 An inserted image shows a rare example of a Simon and Kirby drawing of a female superhero. But more importantly it shows how far Jack has advance in depicting a hero(ine) slugging a foe. In the future Kirby would improve on this even further, but already he made it one of his trademarks. Kirby did not use realism to make the scene so effective. Someone felled by a fist would not have their lower legs come up like drawn here. And exaggerated perspective is not a realistic view at all. A stop action camera would never capture anything that looked like what Jack drew. What Kirby has done was obtain the correct balance of stylized drawing that makes the final result look truer then reality. Posted August 17, 2007 in 2007/08, 3 Timely, Periods, Pulp, z Archive. Before their were comics there were pulps, and publication of pulps did not end once comics started being produced. The popularity of pulps must have continued since Martin Goodman issued a new pulp title Uncanny Stories with an April 1941 cover date. Pulps were printed and distributed by the same means as comics. I also believe they had the same sales arrangement whereas newsstands would tear off the titles to books that they did not sell and return them for credit. That would suggest that pulps had cover dates that were about two months later then their actual release date. If correct, this means that you should be able to compare cover dates of comics and pulps. So although Uncanny Stories would come out one month after the first issue of Captain America, it was probably being put together while Captain America #1 was still at the printers. Simon and Kirby as a team had not yet had their big hit. Joe Simon had some success to his name with Blue Bolt, a comic feature that the publisher liked so much they launched a new title for it. Joe was also savvy at how to promote himself and had become Timely’s first art director. Jack Kirby, on the other hand, had little success with the work he had done in comics books prior to Captain America. As Goodman’s only art director, it is not surprising that Simon was called upon to have illustrations produced for the pulp stories. Kirby may not yet have had a big hit, but Joe was well aware of his talent. So it is not unexpected that Joe would have many of the illustrations in the first issue of Uncanny Stories drawn by Jack. Many pulp illustrations were done on stipple board. Stipple boards have a special surface composed of many small irregularly shaped bumps. Normally penciled illustrations did not reproduced well in publications, intermediate pencil tones would be lost unless they were screened, a process that added expense to production. Penciling on stipple board resulted in translation of tones into small dots. The harder the pencil is pressed, the larger the dots become. With stipple boards the screening of pencil drawings could be skipped without loosing quality. The use of stipple boards in pulps gives us the rare opportunity to see the pencils of comic book artists whose work normally would be inked over. Could this crimson blob, then, huge as a man, be one of the Things that must come when the Comet was in the northern sky? Was this then the murderous phantom that Bob Dean must see consume his own lovely fiancee, to hold her forever there in the heavens where Bob might know her only through a giant telescope? Jack loved science fiction but I suspect he was a little uncomfortable with illustrating this pulp story. So he transformed the “crimson blob” of the tale into these Pilsbury dough boys. The dough boys may not be as exciting as most of Kirby’s creations, but they are better then a bunch of amorphous blobs. The drawing shows the dough boys flying up with their captives. They do so in such numbers that they actually form the tail of the comet that is in the sky, a rather nice touch. I am sure some other artist would have presented more alluring victims but Kirby does a nice job on the men’s futile struggle to prevent the mass abductions. Pulps are basically made from a stack of printed papers stapled along one edge. Unlike comic books they have no center fold so double page drawings such as this one are made with gap down the middle. Generally the originally drawing was just split into the two pieces but in this case something was lost. Note how the shoulder of the man in the center just terminates and he is missing his right arm. A thin strip was somehow left out from the center. I have positioned the two pieces so that the gap represents the approximate size the missing piece. Jack also provided a small insert in the story. I doubt that it really is meant to illustrate anything in the novella. It shows nothing more then a helmeted man firing a ray gun, we cannot even see what it is the ray is striking. It truly is a small drawing and could easily be missed as Kirby’s work were it not for the hand. No stipple board this time, just brush and ink. Not all illustrations that Kirby did for this issue of Uncanny Stories are worthy of mention. But there is this one from “Man from the Wrong Time-Track”, a very dramatic drawing of a man plummeting from a building. The man’s face is almost completely in shadows so it is hard to judge what his reaction is to his situation. The caption does not help either, “In mid-air the gigantic form seemed to stop”. Of course pulp illustrations are not really meant to help with the story, but rather to entice a viewer to buy the magazine to find out what it is all about. Jack must have been very satisfied with this illustrations, it is a rare example of a pulp with his signature. 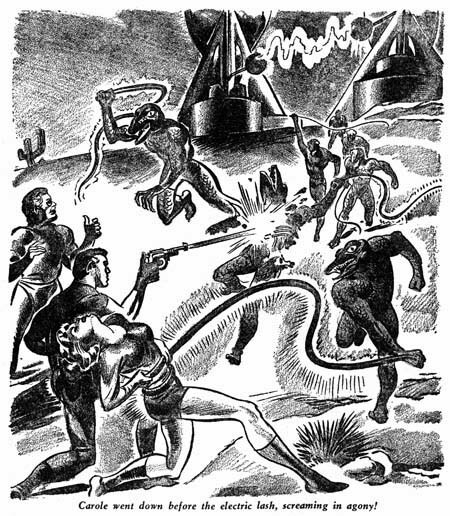 Uncanny Stories v1 n1 (April 1941) Joe Simon illustration for “The Earth-Stealers” by Frederic Arnold Kummer, Jr.
As Timely’s art editor, Joe Simon would generally turn to other artists to provide pulp illustrations but he would on occasion produce one himself. Joe was familiar with working on stipple boards from his previous work as a newspaper artist. Perhaps that is why Joe provides more of a tonal range then Kirby normally did. This illustrations has all the right components; a damsel in distress, weird aliens, frightful weapons (electric lashes), and a mysterious machine (in the background). Nonetheless Joe does not quite pull it off and this pulp illustration is not one of his better efforts. 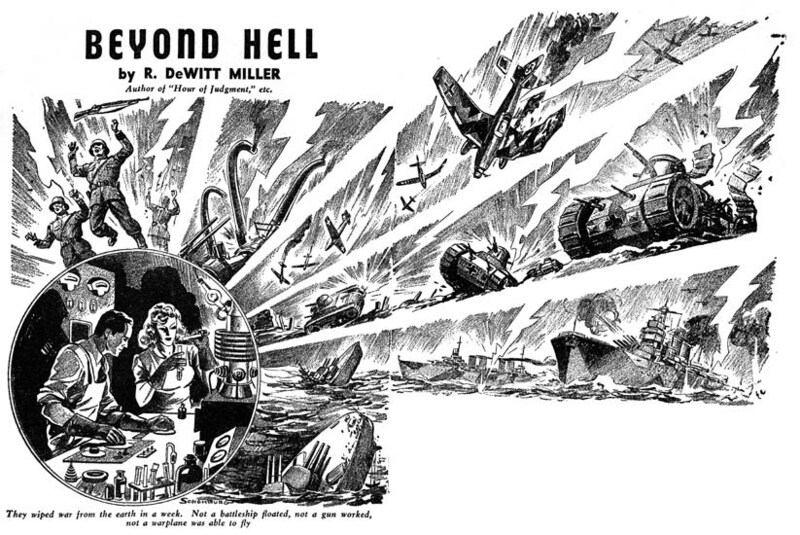 For “Beyond Hell” Simon turned to another talented artist working for Timely, Alex Schromburg. Alex was a natural for pulp illustration. As a comic book artist, cover illustrations was all Schromburg ever did, as far as I know he never drew a story. As an illustrator Alex had a well deserved reputation, particularly for producing complicated comic covers. This emphasis on complexity can be seen in Alex’s drawing for “Beyond Hell”. I have rejoined the two pieces of art by eliminating the gutter. The joint is not perfect and unfortunately combining the pieces only calls attention to how tilted the background art was. However that does not detract from the spectacle that the scientist has unleashed. German soldiers, big guns, airplanes, tanks and fighting ships all fall to the force of science. For many Americans at that time, this must have seemed what was needed to save them from being pulled into the wars that currently enveloped the world. In reality science was never as good at creating the implements of peace as it was of developing the weapons of war. Joe and Jack had been working for Timely for a little over a half a year before working on Uncanny Stories or more significantly on Captain America. Captain America changed everything for Joe and more importantly Jack. After the first few issues of Captain America, Jack would end up drawing all the Cap stories. This along with penciling the Vision for Marvel Mystery Comics would keep Jack quite busy. Too busy to continue his pulp illustrator career. Posted August 11, 2007 in 2007/08, 6 Mainline, In Love, Periods, z Archive. A young lady nearly gets beaned with a baseball. This becomes the first meeting between the new rookie Warren and Patty, who just happens to be the daughter of the teams owner. Romance and then marriage follows. But having the father-in-law as the teams owner brings in difficulty. Warren insists in not getting special treatment. Betty stays home as the team travels and follows her husband’s progress, or lack thereof using newspapers. Warren is not doing well as a pitcher, wants to be sent back to the minors and resents that his special relationship with the owner is the only reason he hasn’t been. Eventually Warren leaves both baseball and Patty. Sometime later Warren returns to pick up his things. During a discussion with Patty, Warren wants to know if she still loves him. Patty says she wants to love him and it is not important that he is not a big star. But Warren has changed, before he wouldn’t accept defeat, now he was a quitter. Warren stays, the owner/father has a medical breakdown, and Warren helps Patty run the team. The team’s pitching staff all have injuries so Warren decides to step in and pitch. He declares he has kept himself in training. His pitching wins the game. Warren tells Patty that winning the game was not that important, it was winning her respect that mattered. Obviously their love has returned as the story ends with a kiss. 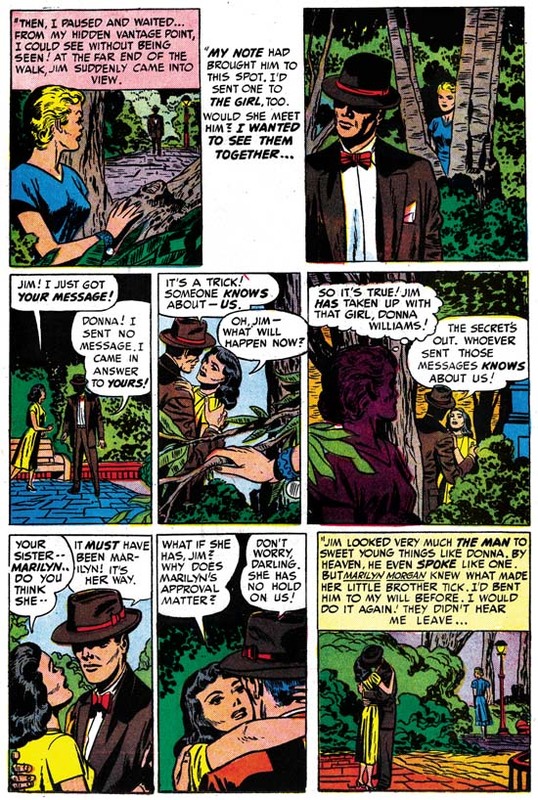 Kirby’s romance stories generally have characteristics that make them unique from all stories by other artists that worked for the Simon and Kirby studio. Kirby emphasized action in his romance stories. This can be scene in “Bride of the Star” in the part that baseball plays. The story is a romance but on certain pages that can almost be missed because of the sport aspect. As mentioned above In Love would also include some short romances along with the feature story. One of these for In Love #1 was a two page tale drawn by Mort Meskin. Despite its short size it is a rather well executed story. In the first three panels (the splash is really part of the story) Meskin provides a conversation between a man and a merchant. 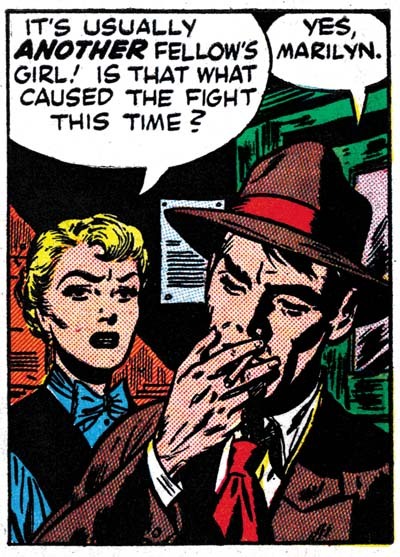 Talking heads are always a problem in comics and particularly so for romances. Mort uses the contents of the store to keep the first and third panel interesting. For the second panel Meskin accomplishes this with the use of dramatic lighting on the merchant. Note in all three panels the main character faces us, normally in the depiction of a conversation you would expect one of the faces to be viewed from behind. This is exactly what happens in the second panel to the merchant. In the first panel Mort has the man turn about for a better light in which to view his purchase in the light. In the third panel although still conversing with the merchant, the man has already turned around to leave. In such a short story it is important to present the main character as much as possible to make a connection with the reader. Mort has done this rather well with such unobtrusive means. Because the story is so condensed, there is only a two panel bridge between the man’s dealings with the merchant and his meeting with his wife. Two panels are not much, but Mort manages to infuse them with necessary mood. After the preceding close-ups we are now presented with more distant view as the man as he walks alone. The night time is the proper setting for his troubled state. Pieces of paper blown by the wind are visual clues to the man’s unsettled thoughts. Beat up garbage pails reflect on the man’s unprosperous condition. The final panel uses a dramatic view from atop the steps, making the simple act of preparing to walk into his house as a struggle over the apprehension he has for the coming confrontation. The story, inspired by the short O’Henry tales, is one about the self sacrifice aspect of love. Mort Meskin has manipulated the presentation of the story so well it is easy to miss what he has been doing. 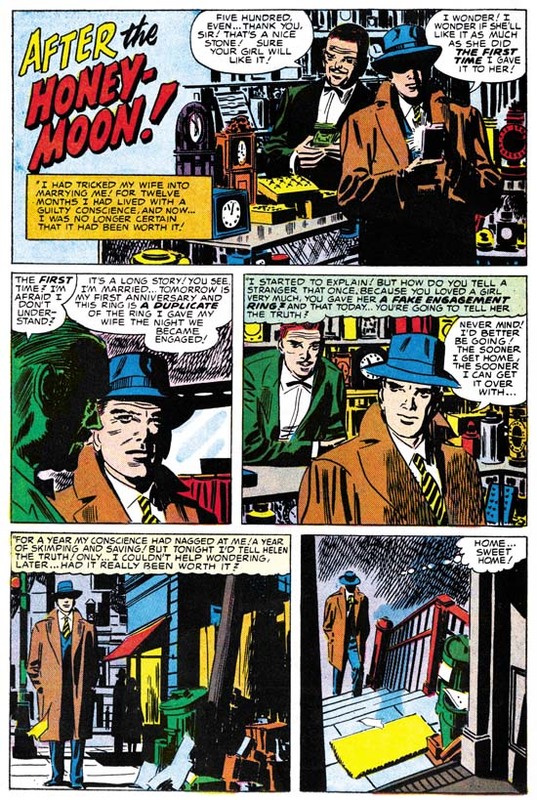 Mort’s drama is not the dynamic action that someone like Jack Kirby preferred. Rather Meskin works unobtrusively to set the proper emotional tone. Because it is so unassertive Mort’s efforts are often overlooked. I am not saying everything Meskin did was at this level, but it is not that unusual either. I previously examined on an even better story “The Dreaming Tower” in my post on Strange World of Your Dreams. I like to believe that my studies of the comics produced by Simon and Kirby have given me an broad understanding of the last days of the Simon and Kirby studio. My views have not changed much from those I presented in my serial post The End of Simon and Kirby. Sure I would like to have more precise dates on some of the key events. I also admit that there is the possibility that I could be wrong in my interpretation of the data. Still I think I have an overall understanding of the relationship between Joe and Jack as well as some of the more important artists of their studio. However that understanding does not include Mort Meskin. Previously Mort played an important part in S&K productions. Mort significantly contributed to Boys’ Ranch, more then I think many realize. Yet when S&K launched Mainline that line included only three stories by Meskin, and all of those from the early issues. Bill Draut and John Prentice played much more important roles in Mainline titles, as did the newcomer Jo Albistur. Why did not Meskin show up more in Mainline? 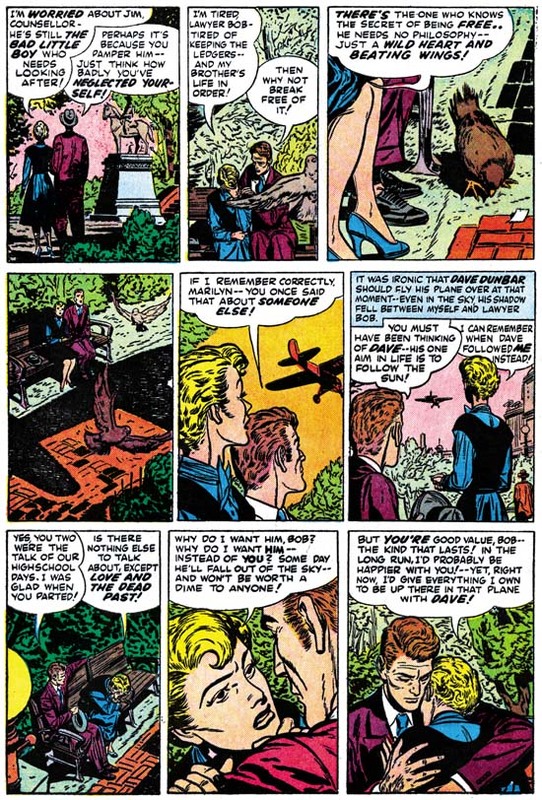 Mort’s presence in the Prize romance comics of this time did increase. But so did Draut, Prentice and Albistur due to Kirby’s absence. 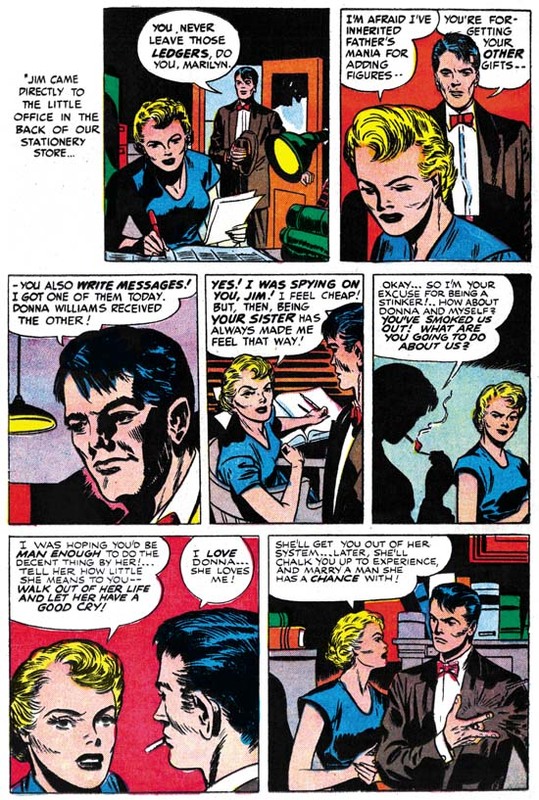 When Kirby returned to provide pretty much all the art for the Prize romance titles, Draut and Prentice show up in Harvey romances which at the time were being edited by Joe Simon. Why did not Meskin make that transition as well? I can think a number of possible explanations, but none that I can support with actual data. Mort Meskin’s relationship with Simon and Kirby during these times remains a bit of a mystery to me. BATTLE STORIES WRITTEN AS THEY ARE LIVED BY THE MEN WHO MARCHED AND CUSSED…AND DIED! HERE IS YOUR FATHER – YOUR BROTHER – AND YOUR SON, TOUCHED BY THE HAND OF WAR! Right above the blurb the comics title is given and it is Night Fighter instead of Foxhole. Night Fighter just does not make sense as a title for a war comic. There is nothing in the blurb to suggest the comic would only be about nighttime battles. Night Fighter was also the title used for a superhero proposal that Simon and Kirby came up with. The original art is known for two covers. The one whose image I show above was created by altering an unused Fighting American cover. 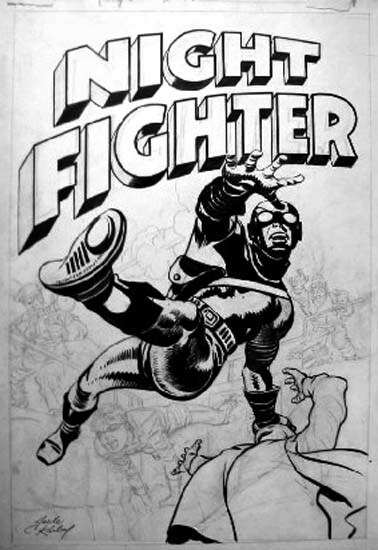 This and the other Night Fighter cover can also be seen in Greg Theakston’s Jack Kirby Treasury volume 2. Both covers show a hero with special equipment, boots that allow him to walk on walls and goggles that permit him to see in the dark. But the use of name Night Fighter in the Mainline advertisement and for the unused superhero is not a coincidence. Compare the logo from the unused Night Fighter covers with the one in the In Love advertisement. There is no question, both are the same design. The most reasonable explanation is that the superhero Night Fighter was originally planned as part of the Mainline lineup and was included in the first state of the In Love ad. 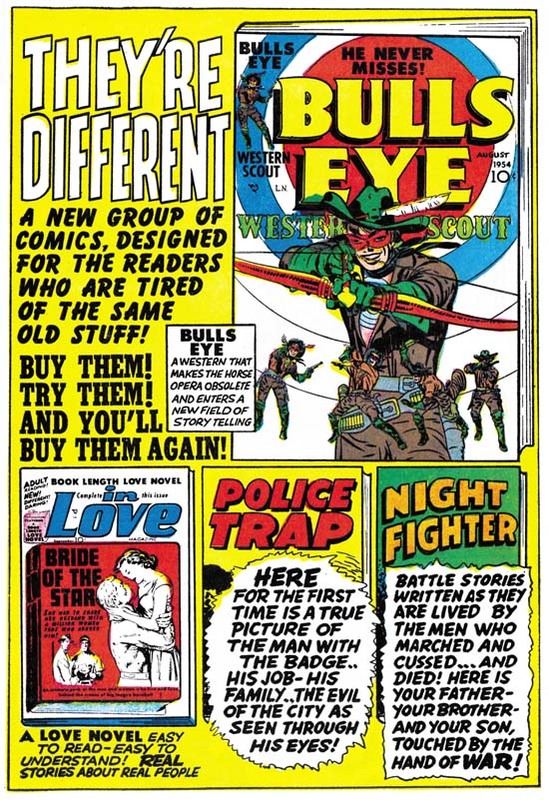 Before In Love #1 was sent to the printers Simon and Kirby decided to replace the superhero entry of the Mainline comics with one from the war genre. They replaced the blurb in the advertisement with one appropriate for the new war title. Somehow S&K never got around to changing the title from Night Fighter in the ad. Perhaps they had not yet decided what to call the war comic and simply forgot to correct it in the advertisement by the time they decided to name it Foxhole. Why did Simon and Kirby decide to drop the superhero Night Fighter from their lineup? With the part that Jack played in the creation of the Marvel universe as well as all the superheroes Simon and Kirby worked on during the war, it is easy to conclude that superheroes were important for the S&K team. However during the years after the war until the breakup of the studio superheroes only played a small part of the comics that Simon and Kirby produced. Stuntman and the Red Demon quickly failed during the comic book blot that followed the war. Captain 3D had an even shorter life when 3D comics turned out to just be a fad. Simon & Kirby had created Fighting American for Prize Comics just before starting Mainline. Fighting American #1 has a cover date of April which would indicate a calendar date for its release as February. In Love #1 with a cover date of September would have gone to the printers at a calendar date of May. Since their deal with Prize was to share the profits, it is possible S&K may have known the sales return for FA #1 in May and perhaps these were not as good as hoped. The only problem with this scenario is that when In Love #1 was sent to the printers it would be expected that some work may have already begun for the next month’s titles. Yet all the art that seems to remain for Night Fighter are the two unused covers. So it is hard to be sure whether or not sales figures for Fighting American affected the decision not to launch Night Fighter. Whether influence by sales figures for Fighting American or not, Simon and Kirby apparently decided the time was not right for launching a new superhero. Perhaps if Mainline had been a success they might have later expanded their line to include Night Fighter. Posted August 4, 2007 in 2007/08, 3 Timely, Periods, Pulp, Robots, Topic, z Archive. I have previously written on some Simon and Kirby or just Kirby stories from the late ’50s linked by the subject of a giant humanoid robot (here and here). In the comments to the first post, Luke Blanchard pointed out Eando Binder’s pulp stories about Adam Link as likely inspirations for these S&K robot stories. I offer another image from the golden age of pulps. The table of contents list Joe Simon and Jack Kirby as the illustrators for the stories. Joe was Timely’s art editor at this time but this was before Simon and Kirby’s great success with Captain America. 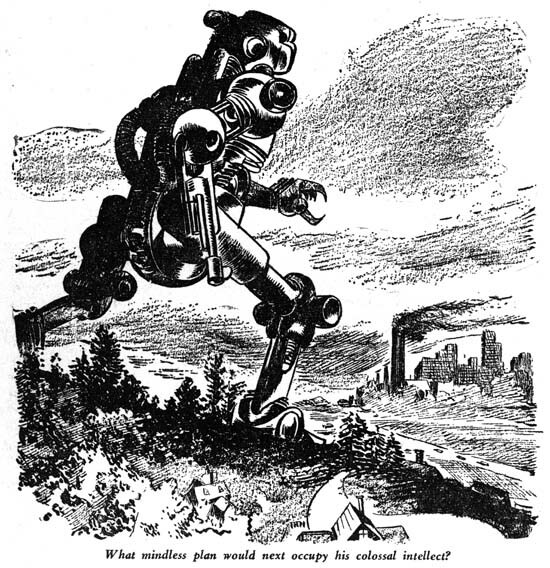 The illustration is a good model for the type of robot S&K would use in 1957 and 1958. Overall humanoid in shape, but blocky enough so that its mechanical nature is obvious. Still unresolved is why robot stories became so important Simon and Kirby in the late ’50s. Posted August 4, 2007 in 2007/08, 7 Freelance, Featured Work, Harvey, Periods, Topic, z Archive. In a previous post I mentioned that some of the stories for the two final issues of Alarming Tales had an Atlas flavor to them. My understanding of Atlas comics of this period is limited so I would not want to over emphasize this similarity. I guess I should give some examples of these Atlas-like stories, but instead I want to comment on three stories that engage me one way or another when I read them. A man sets up some sort of television or radio station deep in the jungle. He encounters an unexpected opponent to his efforts. What follows can only be described as warfare. The man uses a number of ingenious methods to defeat his enemy, but to no avail. In the end only the appearance of another target for his opponents saves the man. The hostile enemy are driver ants. The story brings to mind Alfred Hitchcock’s movie, “The Birds”. That movie was released in 1963 so there can be no relationship between this story and the film. Rather the story’s author had probably viewed a nature program about driver ants, which are also known as army ants. The writer gets some of the facts correct. The swarming of the ants and the fact that they are actually blind. The scripter does not call them army ants but he obviously must have heard the term. But the writer takes the name literally as the ants seem to act as a military unit. While reading I kept wondering if these were meant to be real army ants or whether some radioactive origin would be revealed. Would normal driver ants be expected to pause and contemplate an obstacle that the man has created? Would the male drones for the colony actually be expected to attack and destroy a radio/tv antenna? Would real ants care to reek havoc on electronic equipment? The whole story is so preposterous that it keeps you reading as you wonder what next peak of absurdity would be attempted. Because of, not despite, the peculiarities of the story I actually enjoyed it. I guess one ant story was not enough, Alarming Tales #6 includes “King of the Ants”. A tropical plantation is attacked by some raiders. As a result of some gunfire our hero is accidentally showered with chemicals. He awakens to find he has shrunken to a very small size. Ants seize him, presumable for food, but after the man defeats an enemy, a beetle, the ants bring the man back to rule the colony. I wonder what the mystery food that the ants provided the man was? Perhaps it is bests not to know. Eventually the man returns to normal size while the plantation is still fighting the raiders. The hero uses a tactic he learned from the ants to defeat his human foes. 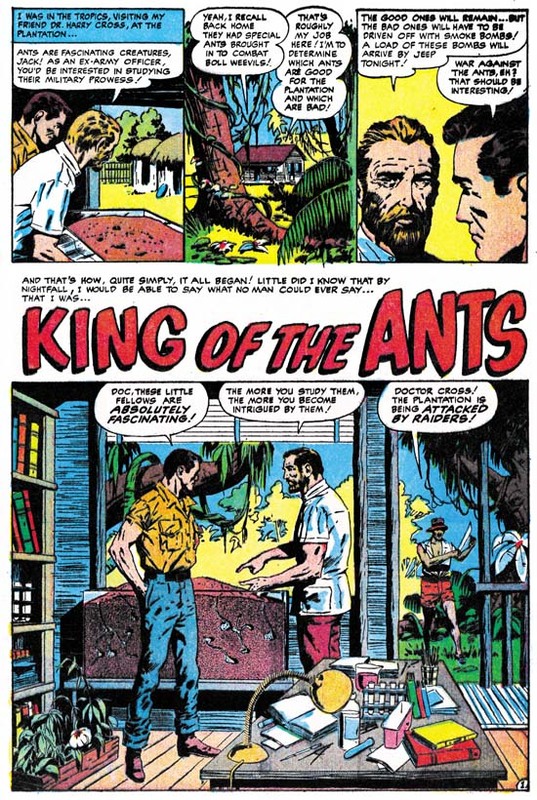 The plot of a man shrinking to a small size and his encounter with an ant colony would appear in Marvel’s Tales to Astonish #27 (January 1962). The similarities of the two plots maybe significant or may just be a coincidence. Ultimately the inspiration for this plot may have been the movie “The Incredible Shrinking Man” that was released in 1957. As I remember it, that movie did not include any ants. But it was common to describe something that looked very small as ant-size so it may not have been too surprising to connect a shrunken man with ants. This story does not have any of the entertaining excesses of “12,000 To 1” but having Al Williamson as the artist more then makes up for that. Next I want to write about “The Strange Power of Gary Ford”, another weird story. A man, Gary, finds a city in the desert where none should be. Here he discovers that he now has the ability to walk through walls and other solid structures. The man credits this to the local water, adding that the city’s citizens do not share this ability because they probably are used to the water. (I do not know what seems odder, that the man made this conclusion or that the water allows the man’s clothes to go through walls as well). The town people welcome Gary and introduce him to their ruler. Gary captures the heart of the shieks’s daughter and professes his love. But actually Gary becomes enamored with another outsider, an attractive redhead. Gary convinces her to leave with him, but not before Gary, using his power, helps himself to the ruler’s jewels. The two escape separately, Gary on his motorcycle and the lady on a horse. No sooner does Gary evade his pursuers then the city disappears and he finds the jewels have turned to sand. Gary regrets that it all was an illusion since the redhead was just the sort a girl he could have married. We next see the redhead also alone in the empty desert, also saying it was too bad it was all an illusion because she really would have liked to marry Gary. This is another of those stories so odd that you just have to shake your head go along with its goofy premise. At the time that Alarming Tales #6 was published the Comic Code had been in operation for a few years. The Comic Code purpose was to insure that susceptible youngsters did not fall under the comic books bad influence and become delinquents. 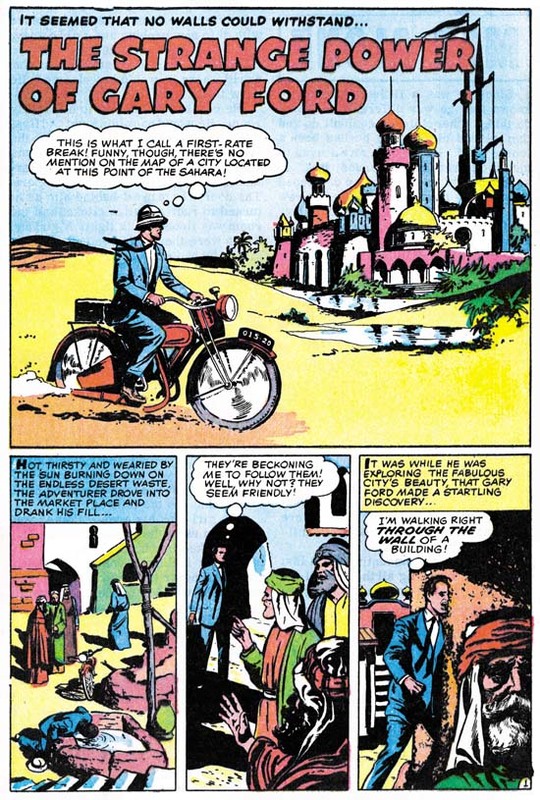 So here is “The Strange Power of Gary Ford” where the hero rewards the welcome he has received from the city’s inhabitants by leading on the sheik’s daughter and stealing a ruler’s jewels. That sounds to me like just the type of morals Comic Code was trying to protect developing minds from. Oh I forgot, the citizens of the city were Arabs, I guess that made it all right.